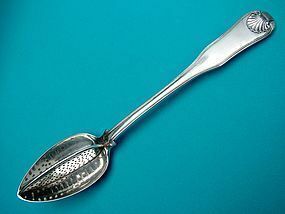 Canton or Hong Kong circa 1840 with carved mother of pearl handles, length eight inches, monogrammed "WL" (? ), fine condition although one blade shows evidence of being straightened (see fourth photo). 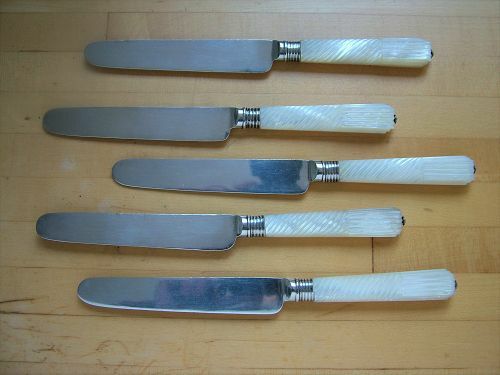 Forbes lists one set of dessert knives, #252 shown in figure 75, but these would appear to be quite rare. No, dear reader, you're not daft though I may be, there are only five pictured here. Yes, we do have the sixth and it is no different than these!! 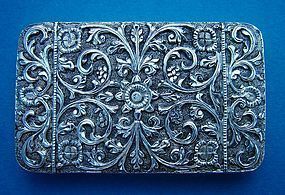 a rare, diminutive example, 3 1/8 X 1 7/8 X just under 1/2 inches, weight 2.3 Troy ounces. It is an unusual pleasure to find an object which is engraved ("J. Diprose, EsqR / from J.J.G. Bombay") with both a name and a location, to lend it an added sense of history. Canton circa 1825, double struck fiddle thread and shell with classic "inset vee" or "Chevron" seam construction, length 11 7/8 inches, weight 6.9 Troy ounces, a minor test mark as shown in enlargement number four but outstanding overall condition, no monogram. 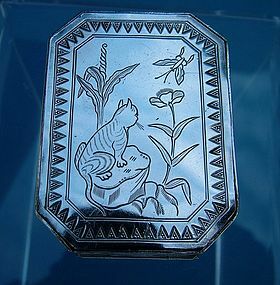 no, not that kind of a cat box, but a snuff box with "trap door" opening and secret compartment, 2 1/4 by 1 7/8 by 1 inches, weight 2.27 oz. Troy, marked with Chinese ideograms only (please see 5th photo).